Probables: Cardinals' pitcher Todd Wellemeyer RHP (7-3, 3.86) will match up against the Cubs' Sean Marshall LHP (0-2, 4.87). Wellemeyer v Cubs: Todd Wellemeyer faced the Cubs on May 4, earning a win, pitching 5 innings, giving up only three hits while walking four and striking out four. #50: The Cards have reached the fifty win mark, now 50-39. How the Redbirds stand: With last night's victory over the Chicago Cubs, the Redbirds have made up the ground they lost yesterday, now 2.5 games behind the Cubs in the NL Central. Lohse no decision: Kyle Lohse got a no decision, his record remaining at 10-2. Izturis set to return: Shortstop Cesar Izturis is due to come off the DL today. Izuris has a hamstring strain. With Aaron Miles swinging a hot bat and holding his own on defense, plus steady contributions from Adam Kennedy, the recently disabled Izturis might not get thrown right back in the lineup. Manager Tony La Russa wants to be careful with Izturis's return to action as a precaution. Reyes optioned: Pitcher Anthony Reyes is coming off a stint on the 15-day DL, and will be optioned back to Triple-A Memphis. Reyes had a right elbow strain. Wallace hits first round-tripper: Recently signed top draft pick, Brett Wallace, hit his first home run for affiliate Quad Cities River Bandits (A) at Modern Woodmen Park. Wallace had tallied only two hits in 12 at-bats to that point. The homer came in a 9-2 victory over the Peoria Chiefs. Two relief pitchers threw a combined five-hitter in the win, Chuckie Fick and Wayne Daman. Granny beats AAA-Redbirds: Not grandma, but a grand slam by Brian Buchanin of the Omaha Royals, according the the Memphis Commercial Appeal, beat the Triple-A affiliate Memphis Redbirds 8-6. 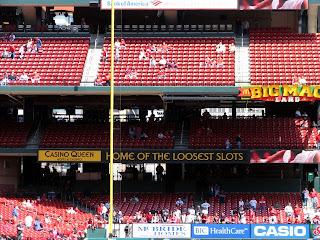 Hitting his 13th home run of the season in the losing cause was David Freese. Future Futures pitcher Jaime Garcia is scheduled to pitch for Triple-A affiliate Memphis vs. the Omaha Royals today. Garcia has recently been named to the Futures roster.